← YES, THERE ARE SOME BLUEGRASS DOMINICAN STUDENTS AT THE DOMINICAN HOUSE OF STUDIES IN WASHINGTON, D.C.
One casualty of Original Sin was man’s gift of speech. We know from the account of the Tower of Babel that God meted out the confusion of language as a punishment for pride. But that particular punishment only sets in relief the damage that was really present from the start. In the fallen world, man’s power to articulate the truth and praise the Creator becomes also a means of deceit and manipulation. We find it throughout scripture, from Cain’s dodge – “Am I my brother’s keeper?” (Gen 4:9) – to Judas’s insincerity: “Hail, Rabbi!” (Mt 26:49) We see it all around us, in the constant distortion and twisting of words to serve greed and gain rather than truth and worship. Most sadly, we see it in ourselves, in our own use of words to manipulate, blame, and deceive. All things are to be restored in Christ, human speech included. The Word of God redeems our words by His Incarnation. In assuming our human nature, He also takes to Himself human speech. He redeems our speech by making it not only His own but also the vehicle of His truth. Speech has always been a sacred thing. But now that God Himself has spoken as we do, it carries divine significance. The Blessed Virgin Mary, as the dawn announcing our Savior’s coming, heralds the restoration our Lord brings. She “entered the house of Zechariah and greeted Elizabeth.” (Lk 1:39) We don’t know what she said. But we do know that at her words John is sanctified in the womb. Elizabeth tells her: “For behold, when the voice of your greeting came to my ears, the child in my womb leaped for joy.” (Lk 2:44) Already in Mary we find human words redeemed and made a vehicle of grace. Our Lady anticipates the instructions Saint Paul gives to all Christ’s followers: “Let no evil talk come out of your mouths, but only such as is good for edifying, as fits the occasion, that it may impart grace to those who hear.” (Eph 4:29) We should heed her example, because what is true for Mary in a singular way is meant to become true for us as we grow in grace. Our words should also be gracious, in both their delivery and their effect. Mary can speak gracious words to Elizabeth and cause John to rejoice because she first spoke words of trust to the archangel Gabriel: “Behold, I am the handmaid of the Lord; let it be to me according to your word.” (Lk 1:38) Of course, her response of faith stands in stark contrast to Zechariah’s words of doubt: “How shall I know this?” (Lk 1:18) He was struck mute – and fittingly, because without faith we have nothing to say. After praising her greeting, Elizabeth also acknowledges Mary’s faith: “And blessed is she who believed that there would be a fulfillment of what was spoken to her from the Lord.” (Lk 1:45) Mary speaks words of trust and thus becomes the bearer of the Word and a bearer of gracious words. To speak in a way that builds up – that is “good for edifying” – we must first believe in the Builder. It is trust in Him that enables us to speak words of truth, hope, and encouragement. Confidence in Him brings both strength and gentleness in our speech. Strength, because we speak as children of the Almighty. Gentleness, because we know that the power is in His truth, not our own ideas. We do not need to force it or devolve into harshness, because His truth can do great work with a little. If we do not trust in His words and in His Word, then our speech remains confined to our own thoughts and relies on our own power. We soon end up either silent out of fear or harsh out of insecurity. Most of all, our Lady reveals that gracious words require humility. Adam’s pride confounded his speech. Zechariah’s insistence on his own knowledge robbed him of his voice. Mary is the handmaid of the Lord, willing to be overshadowed by the Spirit. She is not full of herself. Her perfect self-forgetfulness means that she has room in her heart and mind for God’s word. She thus has something to impart. We, on the other hand, do not like to be overshadowed. We are full of ourselves and thus have little room for His word within us. . .and little to impart to others. In her visit to Elizabeth, Mary’s words imparted grace to those who heard. In our visits, especially in this season, may truth in Him and humility about ourselves enable us to do likewise. Fr. 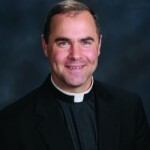 Paul Scalia is a priest of the Diocese of Arlington, Va, where he serves as Episcopal Vicar for Clergy. His new book is That Nothing May Be Lost: Reflections on Catholic Doctrine and Devotion.